Can Sanders Break from the Democratic Party? Can the Bernie Sanders campaign lead to a split away from the Democratic Party? That’s the subject of a debate I’ve been having with some socialists who support Sanders. How could such a split come about? 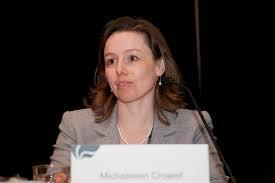 Michaeleen Crowell, Sanders Chief of Staff. She typifies the Democratic Party operatives that Sanders has surrounded himself with. Senator Ted Kennedy and before that for Congresswoman Denise Majorette (D – GA). His campaign communications director is Michael Briggs. Briggs had formerly worked for Democratic US Senators Paul Simon, Carol Moseley Braun and John Edwards. His campaign director is Jeff Weaver. Weaver’s entire political history is in the Sanders staff. “But before he came on board Bernie 2016, Weaver had retired from politics to launch one of the DC-area’s biggest gaming businesses.” (See this article.) This entrepreneur is not exactly the type who would encourage building an independent movement. His Field Director is Phil Fiermonte. Prior to working for Sanders, Fiermonte worked for the United Professionals of Vermont – AFL-CIO. They are part of the American Federation of Teachers, whose national leadership was the first to take a position on the Democratic nominations. They endorsed Clinton. There is no record of Fiermonte having any open conflict with the AFT executive board. A major strategist for the Sanders campaign is Tad Devine. Politico dot com describes Devine as “a big name in Democratic politics” who has worked for John Kerry, Al Gore and Michael Dukakis. Devine is joined by his “business partner” Pete D’Alesandro (Iowa campaign director), Scott Goodstein, formerly of the Obama campaigns, Arun Chaudhry, who was a White House videographer, and Keegan Goodiss, who worked for the Democratic Congressional Campaign Committee. In other words, Sanders has surrounded himself with Democratic Party operatives. Those who expect any portion of his campaign to break away from the Democrats under normal circumstances are living in a dream world. “But we’re not living in normal times,” some might say. “The pressure on the Democrats is enormous.” True enough. What would happen, for example, if Sanders were to win the majority of the votes in the primaries but lost the nomination due to the votes of the “Super Delegates”? This would cause a furor, but the most likely outcome would be for Sanders & Co. to lead a campaign for “democracy” within the Democratic Party. Given those he’s surrounded himself with, it’s extremely difficult to see how Sanders and Co. could do anything else. Suppose this were combined with a severe economic crisis? Would his base of support demand he leave the Democrats and drag him with them? Not impossible, but what seems more likely is that many if not most of them would be drawn into a campaign to reform the Democratic Party. The main qualification is suppose there were some sort of other huge crisis. Suppose, for example, Obama ordered a military invasion of Iran and hundreds possibly thousands of body bags started coming home? In the first place, that is highly, highly unlikely. In fact, the main reason that Corporate America installed Obama in 2008 was exactly to avoid such a disastrous blunder. (Disastrous for them; they don’t care about anybody else.) If that were to happen, then a mass movement would spring up overnight. And given Sanders support for the State of Israel, it’s not even certain what his position would be. But in any case, it’s possible that he and some other Democrats could be swept along. Such an event is extremely unlikely (to say the least), but it can’t be ruled out. But it’s a huge mistake to place all one’s eggs in this one basket, especially since it is not likely to materialize. I wouldn’t put an egg in that basket, even if it was likely. A Sanders split from the Democrats would be a sign that the Democratic franchise is weakening. It would hopefully encourage some real independent left organization. Sanders would not be qualified to lead this. He would never do it, other than for the most pragmatic of reasons related to his own aspirations. As of today, it looks like Hillary may be facing criminal charges in her email scandal. Another reason for Sanders to stick with the Democrats. I think we can assume this comment from PW (“People’s War”) is sarcastic. It also completely misrepresents what the article says.